"I was looking for garlic bread that was a bit different when I saw a photo of some bread that was sliced, cheesy, and tasty-looking. This was my effort at recreating it in my air fryer." Cut a crisscross almost all the way down into each roll, leaving the bottom crusts intact. Fill all the slits with Parmesan cheese. 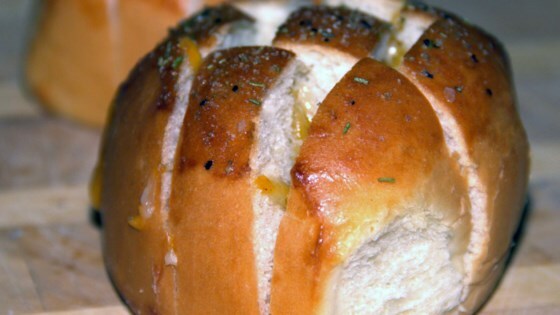 Paint the tops of the rolls with melted butter; sprinkle equally with garlic seasoning. Preheat an air fryer to 350 degrees F (180 degrees C). Place rolls in the basket of the air fryer. Cook until cheese is melted, about 5 minutes.